With 1972 Stan had become too busy with other projects to continue writing the comics, and moved on, with Editor-In-Chief Roy Thomas taking his place. Stan’s final run began in March (having already taken a five-month break from writing) and oversaw a six-issue run that was devoid of any fresh inspiration, with a four-part “return of Galactus” story, followed by a comeback of the underwhelming creature from Issue #97. Stan’s final words in the title have the FF remark to one another that it’s the differences between people that provides their kinship, an earnest and well-meaning remark that’s perhaps better suited to one of his Soapbox columns rather than the fiction of the comic itself. Stan doubtless thought that he was leaving readers with a heartfelt message, but the end result can only feel a little trite, however much the message itself is still one we can learn from today. There's also the matter of Stan's final issues being events with no team dynamic to tie them together. The return of Galactus to Earth, something of a dramatic non-starter the second time around, takes precedent over any interpersonal conversations the team might have. Sadly, most of the really important interactions between the team in 1972 were written by Roy Thomas; Stan, it seems, was going through the motions while his concerns were elsewhere. That's not to say that there isn't some merit in Stan's final issues, or even some humour. The Thing deciding to eat a soldier's rifle, for example, is a stand out, but with Galactus being a far more physical and less mythic creature than before, it's hard not to argue that Stan would have been better served by leaving on top in 1971. It's notable that, once more, authority is seen to be the enemy. While the FF are particularly cavalier in these issues, regularly smashing up public property with little thought, it's soldiers that make their lives more complicated, or even the President, who cynically muses over the fate of the Earth "And yet, with an election coming up --" (Five months after the cover date, Richard Nixon would be reelected by one of the biggest landslides in American history, defeating his opponent George McGovern by over 60% of the vote). Agatha Harkness also begins to take the place of the Watcher, appearing mystically to warn the team of Galactus' impending arrival, and then later, to improbably translate Reed's words into every language known to man. Considering their son's nanny had already defeated the Frightful Four single-handedly, it's some wonder they didn't invite her to join the team. What really harms the book during 1972 is that so many of the events therein are just so unremittingly dumb. Take Issue #120, where the FF are prewarned that they're about to be under a terrorist attack. When confronted by five armed men firing guns at them, a man who can melt bullets, a man who can bounce bullets off his rubber flesh, and a man who can’t even feel bullets get together for a stand with a woman who can create an invisible, bullet-proof shield with the power of her mind. And together they decide to... dodge out of the way. Although Sue has no power-enhanced physical skills, she dodges bullets from six machine guns… by stepping to the side! This from the same man who had Johnny plunging to his death after forgetting to flame on in August of the previous year. Even under such hostile attack conditions, Sue decides the best form of defence is not covering her teammates with her field, or using it to bounce the bullets back upon their attackers, but leaving her mortal body exposed to danger while making one of the terrorist's arms invisible. Then there's Ben trying to mend a hospital wall with a huge hole in it, by pulling the two parts of the wall together like a pair of curtains, something which defies logic. (It’s not just Stan that crafts idiotic sequences… look at Johnny attempting to punch Ben in Issue #126). Although relationships between the four are general cordial again, Johnny notably stands up to Reed on several occasions, and Reed’s physical ability is greatly toned down. Not only is he frequently knocked unconscious (including by a wind projected by Galactus, a wind that doesn’t KO any of the rest of the team, including Sue) but spends two issues in bed due to exhaustion. In all, he loses consciousness in seven of the issues throughout the year. While Reed’s physical prowess would come and go, generally from this point on he would face a downward trajectory as a functioning member of the team in battles, with Sue becoming increasingly more powerful. Only the previous year Reed had been able to battle the entire FF single-handed while under mind control, but in 1972 he knocks himself out by accidentally zooming into Ben’s hand. Perhaps the most significant moment occurs in Issue #126 where Reed tries to break up a fight between Ben and Johnny, and ends up half-conscious in Sue's arms, with her urging them not to accidentally kill him. It's a far cry from the man who spent the 60s dominating both, or even the man from 1971 who would call Johnny "boy" and "kid". 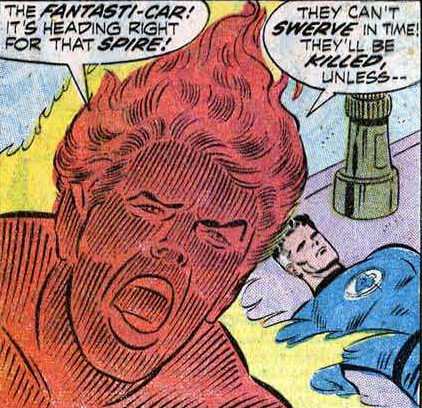 It's somehow hard to imagine Jack Kirby drawing a panel where Johnny deliberately burnt Reed's hand, and Reed reacting impotently. With Roy Thomas taking over, there are notable changes. Although Stan’s work could be worthy almost to the point of preachiness, Roy takes this even further, giving the FF a nakedly liberal and emotional heart. All of his three stories as regular writer in 1972/1973 ended with characters shedding tears, an unashamed attempt to reconfigure the FF as more dimensional characters. An attempt to retell their origin sees details shifted, such as Reed stating that his monicker of Mr. Fantastic is “immodest”. Ben thinks of the time as being both 1961 and “ancient history”, stressing once more that the concept of Marvel Time had yet to really reach the title. Roy gives Reed more of a sense of humour than before (“My left arm might be as limp as last night’s noodles…”) and also, most notably, changes the tone of the caption boxes throughout the issues. Whereas Stan had used them to talk to the readers, Roy has the affectation of talking to the characters within the narrative. (“But you can’t talk, can you, Benjamin J. Grimm?”) While Stan’s schtick may have been corny and seem old-hat today, it was a vital element in making early Marvel readers feel part of an inclusive "club", and the sense of Roy closing off the comic fourth wall possibly created a distance between the material and the readers. Then there’s also a tendency to have characters explain things to themselves purely for the benefit of the audience. While there’s a reduction in the four verbalising attacks upon their person (Stan's penultimate issue has Johnny remarking at how he's had a tree thrown at him, before the impact finally shuts him up), Johnny remarking that Franklin is Reed and Sue's son "... my nephew!" is a step too far. Yet Roy often excels in adding new layers to established characters. While the Frightful Four were favourites of the Lee-Kirby years, they could be said to be more than a little one-dimensional. Roy gets to elevate their characters, particularly the Sandman, giving him and Ben some blue-collar rapport as they both fight on the same class level. With the innocence of earlier times now past, Thomas is able to raise the Sandman’s level of obnoxiousness, with – in an issue where the Thing makes three sexist remarks himself – "Yeah? Well, I’m a firm believer in equal rights, girlie -- -- includin’ the right ta belt you right in the --" The following issue this most un-PC of characters gets to indulge in the delights of homophobia with "Okay, people – it’s over! He’s as limp as Tiny Tim’s wrist!" So good is this rendition of the evil quartet that we even get a splash page tribute to Kirby thrown in for the conclusion the following year, and the tale introduces Thundra, one of the few arguably classic FF characters created of the Lee-Kirby era. The increase in political tone during the year continues, though often outside the strip itself. April’s issue sees Stan’s soapbox reference the September jail riot that resulted in 43 deaths in Attica Prison. Although Stan’s plea for understanding amongst all men doesn’t directly involve the Fantastic Four, it’s a coincidence that in 1971 Black Panther leader H. Rap Brown was imprisoned there. Issue #119 (guest-written by Roy Thomas) features T’Challa being broken out of prison by Ben and Johnny, and changing his name to “The Black Leopard” to avoid any association with the group. As T’Challa himself puts it, it seems not to arise out of a political intent (at least within the fiction of the book), but out of an almost egotistical need to be only known for himself. Another coincidence is that the same issue has Ben and Johnny stop a man hijacking their plane, trying to make it arrive in Cuba… in November of that year, the Southern Airways Flight 49 from Memphis was successfully hijacked and forced to land in Havana. "Three Stood Together!" is an attack on apartheid so unsubtle that even the Thing is mistaken for a black man by white African taxi drivers, but it remains one of the most significant and adult issues the title ever ran. Buscema’s art again works well within the pages of the book, though it’s arguable his take on the Thing is too “cute”. The most notable experimentation comes with Johnny. From Issue #126 onwards, he redesigns Johnny’s flaming form as a sleeker look, with more body than flame, and far less of the “lines” that make up his body. Some of the renditions of this new-look Torch included his eyeballs being coloured yellow, which did give him the vague look of a red Silver Surfer. Opinions on how this looks are subjective, but it was popular enough to be picked up by other artists and last until late 1976. However, this might not have been John’s decision, or at least his alone. Buscema only did breakdowns (half-finished pencil layouts of each panel) with Sinnott doing full pencilling and inking on #128. This was unannounced to see how it would work, and then, owing to John’s work on Conan, the set-up was maintained for the rest of their time together from #134 onwards. 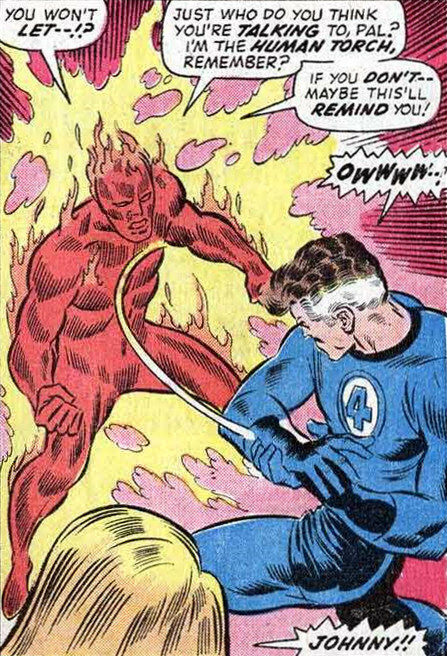 Less lasting was Buscema’s decision to make Johnny’s hair turn into red flame and show human features through his flame. While a glimpse of this can be seen in Issue #123, it’s not until the July issue that it really comes into effect, and, after just two instalments, the idea is discarded altogether. Despite the art within being of a fine standard, the covers are again incredibly poor, not helped by following the Lee-Kirby years where so many classic covers were in evidence. In fact, there’s an argument to be had that the title didn’t have a single classic cover until Jack Kirby returned as cover artist in 1976. Perhaps one thing that doesn’t help is that the main image was housed inside a smaller panel during 1972, the logo placed in its own separate space, rather than over the cover illustration as before. While the new logo is, in effect, the “second” logo for the book, there were subtle changes to the original that may have gone unnoticed: from Issue #16, not only did the logo have a form of “3D” effect, with shadowed writing underneath it, but it also dropped the “the” from the title. Issue #95, while ostensibly the “same” logo, introduced larger, chunkier lettering to make up the same general font. Speaking of trivia, then the FF somehow manage to get from the Baxter Building rooftop down to the street between issues #121 and #122. Also look out for the start of #126, where Reed uses his “thought projector helmet" to conjure up an illusion of Sue being murdered by Doctor Doom. Reed cites it as the most “repulsive” image he could think of… and not, as he would in 2009, a case for his defence council. And despite Marvel deciding that Ben being able to blow down doors was a silly idea (see 1969), we get the amusing sight of one of his sneezes destroying an apartment in Issue #119, which had also been witnessed in 1970's Issue #102. Also look out for the header of “The World’s Greatest Comic Magazine!” being changed to “Comix” with Roy in charge, then returning to its normal spelling with Gerry Conway’s first issue in 1973. Then there's the first panel on page 19 of Issue #124... is that a Kirby panel that's been dropped in? Finally, talking of Kirby, then the letters page of the Issue #121 contains what appears to be an underhand dig at Jack with "...at a time when the competition is folding comics titles (even those by former Bullpen greats) at an alarming rate." For the only time in a Lee-scripted Fantastic Four, we get what might be a suggestion that Ben was born there. A long-established part of the mythos is that he grew up as part of the Yancy Street Gang, which is why they target him, but it's easy to forget that this wasn't always part of his backstory. It's not even a case of him simply not mentioning it, either - there are multiple instances throughout the sixties that he not only dislikes the gang who hound, but that he definitely isn't from there. 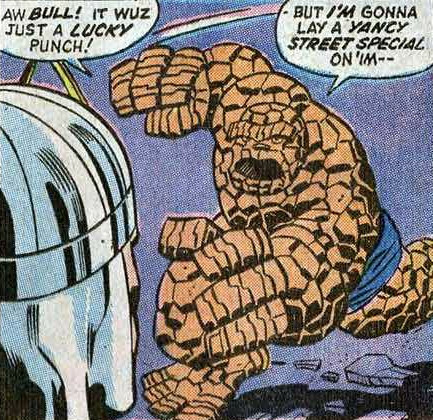 1972 sees this change somewhat, with him offering up a punch that's a "Yancy Street Special"... though as this was written by Stan, it could be just that it's the sort of punch he wants to give to the Yancy Street Gang. The first instance of Ben coming from Yancy Street appears to have been in his own team up title, Marvel Two-In-One. Not exactly “required”, but Kala, the Mole Man’s bride, had previously been seen in July 1963’s Tales of Suspense #43 (***) alongside Iron Man. Although only being a relatively recent comic book, it's amusingly dated, almost as if it had fallen through a time warp from the 1940s. Back up comic strips with names like "I Was A Victim of Venus!" meet two-page text story "The Journey". Kala, meanwhile, is revealed to be a villainess who ages when upon the air of the surface world in an amusingly quaint 13-page story that is so staid and lifeless it's often like one of the Superman stories of the age.